I would suggest reading my guide on tint, binning, and CRI before reading this. 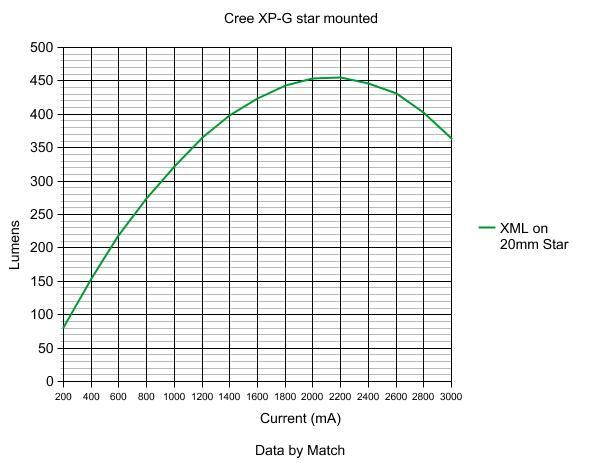 Going by this data the XP-G can go up to 2 amps before the law of diminishing returns kicks in. It can be purchased in many places. Intl-outdoor has a great selection of them in a variety of tints. The XP-G2 is the successor to the XP-G. It is more efficient along with having a different die design. It was originally introduced in July 2012. It also is 3.45 mm by 3.45 mm with a die size of 1.4 mm*1.4mm. (1.96mm2) It can be identified by its size along with its lack of a grid. As the successor to the XP-G, the XP-G2 is used in the same category of lights. Due to it being released recently it has not found its way into budget lights yet, but it most likely will in the future. Like the XP-G it also comes in a Hi-CRI version, however since it is a new LED it cannot be found anywhere for sale. Intl-Outdoor has a fairly good selection of them, in a variety of tints. The XM-L first became available in December 2010. It is a 5 mm*5 mm LED with a die size of 2 mm*2 mm. (4mm2) It is one of the larger LEDs that Cree makes and can be identified the 6 strips in a grid across it. The XM-L is generally used in lights that run on Li-ion batteries due to it needing large amounts of current. It is used in a number of throwers due to its large output. The XM-L can handle up to 4.4 amps in this instance before it reaches the point of diminishing return. Due to the extremely large amount of heat that is being generated here a large heatsink with adequate surface area is a must. The XM-L can be found in a number of different tints, which is covered very thoroughly in this thread. The XM-L can be bought most anywhere, but as usual I will recommend Intl-Outdoor. The XM-L2 is the successor to the XM-L, it first became available in December 2012. Like the XM-L it is a 5 mm*5 mm LED with a die size of 2 mm*2 mm. (4mm2) Unlike the XM-L it does not have a grid on the die. 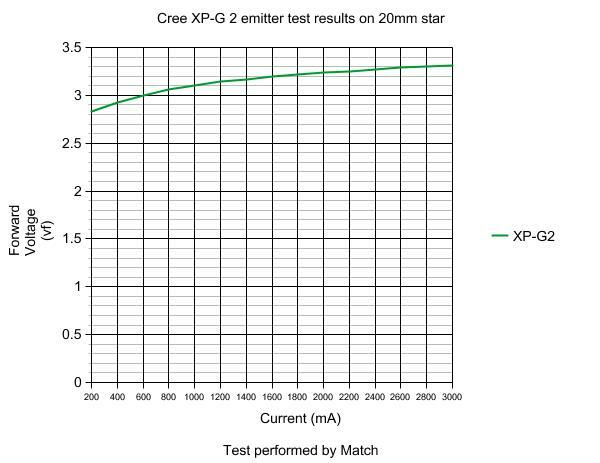 Since the XM-L2 is extremely new there is no lumen testing that has been done on it. 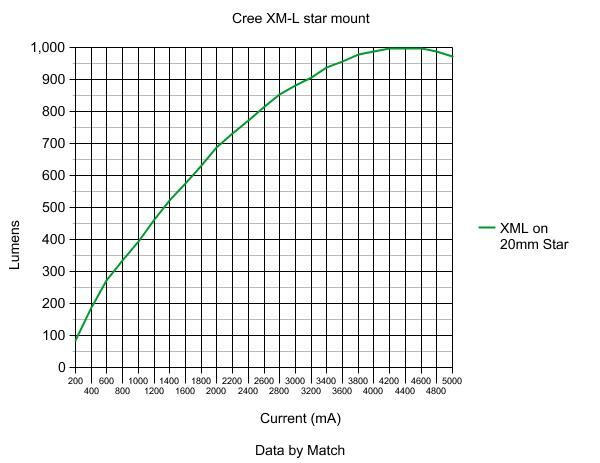 For that reason I have created a graph based on the approximate lumen values supplied in the datasheet. I assumed it was a XM-L2 U2. Obviously, this graph does not tell us anything new. So far the XM-L2 can only be bought in NW or CW. The advantage is that a NW T6 XM-L2 is equal to a NW U3 XM-L. As there never was a NW U2, let alone a U3 this is a huge advantage. So far they only can be purchased from Mouser. As time passes they will most likely be available from more sources. Due to the extremely small die size the XR-E is often used in dedicated throwers. For example the DEFT EDC used it, as did basically every other custom throw king. People do not use it in flood lights due to its low lumen output. In this instance the XR-E can handle up to 2.1 amps before hitting the point of diminishing returns. In throwers it is generally driven around that level. The newer XR-Es are reported to pull up to 2.5 amps while still increasing in brightness, but this is unconfirmed. The XR-E is hypothetically available in tints ranging from CW to WW, but the usual sites do not seem to sell anything other than CW. LedSupply has a great selection of XR-Es in a variety of colors. In September 2008 the XP-E was released. It is 3.45mm*3.45mm with a die that is 1mm*1mm. It has a grid with 3 strips. XP-Es are generally used in the same lights as XP-Gs. They are small and do not require very much current, perfect for lights that use a boost driver. The low lumen output does not matter in this type of light as the driver can only supply so much current. 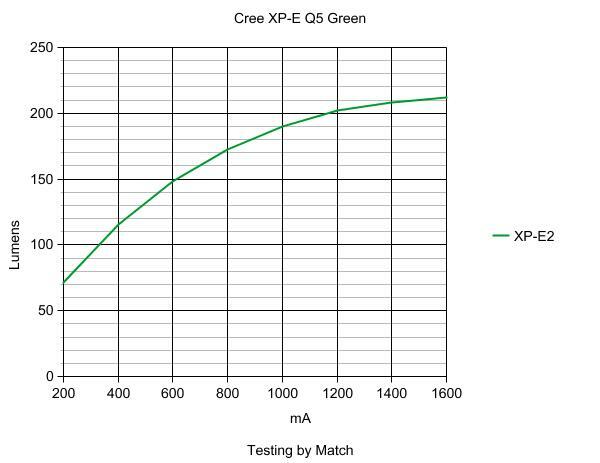 Note2: Ignore the green line, it is for green XP-Es. XP-Es generally need around 3-3.5 volts depending on the current. The XP-E goes up to 1.6 amps without reaching the point of diminishing returns. Sadly, it does not get very bright despite the high currents. The XP-E is commonly available in CW along with green and red. Intl-Outdoor has a good selection of them. The XP-E2 is the successor to the XP-E, it was released in September 2012. Like the XP-E it is 3.45mm*3.45mm with a die that is 1mm*1mm. Unlike the XP-E it does not have a grid of bond wires. It is approximately 20% brighter than the XP-E. The XP-E can handle currents up to 1.6 amps before it reaches the point of diminishing return. Most lights tend to drive it with less current, generally around 1 amp. The XP-E2 is hypothetically available in tints ranging from CW to WW, but so far I have only seen CW. Digikey has a large selection of XP-E2 emitters. The Nichia 219 is a LED that has exploded in popularity recently. It has an extremely high CRI at 92, while being NW. Most LEDs that are 92 CRI are 3000k, not the 4500k of this LED. Note: While this LED is supposed to be 4500k, the newest ones coming from IS are closer to 4200-4300k. Note2: The Hi-CRI Nichia 219 (type H-1) only goes up B10 bin. This is because in order to get a Hi-CRI they must have a larger ratio of red to other colors. To do this they block select amounts of non-red colors. The Nichia 219 can handle up to 2 amps in this test, but the amount it increases by is rapidly dropping. 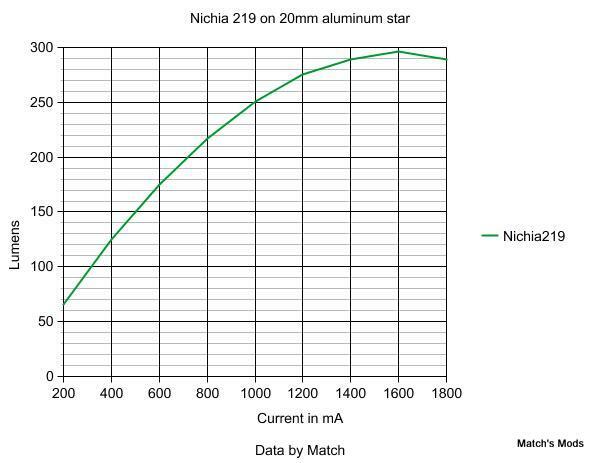 The advantage to the Nichia 219 is the Hi-CRI, due to this the other tints are not used since they are not Hi-CRI. Illumination supply stocks the Nichia 219. The SSC-P7 was one of the first LEDs to be over 500 lumens. It originally was released in 2008 (I think) and is made up of 4 dies. It was made by SeoulSemiConductors, a competitor to Cree. Each die is 1mm by 1mm and they are all wired in parallel. The SSC-P7 was recently discontinued. The SSC-P7 maxes out at 5.6 amps in this test, but it is generally driven closer to 3 amps. Due to the large amount of heat generated a large heatsink is a must. While it may seem that it could be brighter than an XM-L, in reality the XM-L will beat it; both in brightness and efficiency. It was extremely popular at the time, but fell out of favor due to: the high vf, high cost, large size, and low efficiency. It is not for sale anywhere as it was discontinued. The MC-E was the Cree version of the P7. It uses 4 1mm*1mm dies. Unlike the P7 each die can be individually controlled, this means one can wire it 4S, 2S2P, or 4P. They also produced a MC-E with a Red, Blue, Green, and White die; this was used in the Quark RGB along with other custom lights. It had a much smaller footprint than the P7 and was star mounted. The MC-E was used in all kinds of lights, especially ones that wanted maximum brightness. It also was used in RGB lights since it came with 4 dies of separate colors. The MC-E reaches the point of diminishing return around 5 amps. Despite using the same dies as the P7, the P7 was favored by modders since it could handle high currents and being direct driven better. The RGB MC-E is available from Intl-Outdoor. Note: While the specs of the SST-50 are great it does not do very well in flashlights, often dying a premature death. Active cooling or a large surface area (fins) is a definite must for this light. The SST-50 is generally used in higher end lights, along with small pocket rockets. Despite what the rating of the LED is, it can go up to 6 amps and beyond. This means it is better to use the SST-50 rather than the XM-L if the drive current is over 4 amps. Mouser sells the SST-50 LED here. The SST-90 is one of the brightest single die LEDs. It is mace by Luminous, a competitor of Cree. Like the SST-50 it is rather expensive so is not commonly used. It is attached to a 10mm by 11mm substrate. The die is 3mm*3mm for a total area of 9mm2. The SST-90 is often used in large reflectored throwers due to the massive output. An example of this would be the SR90. 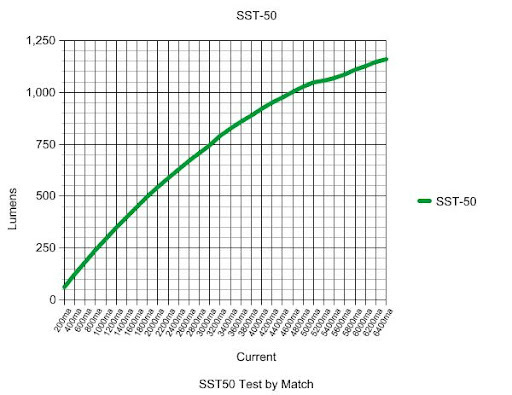 The SST-90 can go up to 9 amps and well beyond as demonstrated by this graph. It does so while putting out over 2000 lumens. Mouser sells the SST-90 here. The MT-G2 was released in April of 2012 and only recently has made its way into custom flashlights. Unlike most LEDs it has a vf of around 6 volts. (I am focusing on the 6v version) This allows it to run at 6 volts and 3 amps and still produce over 2000 lumens. It is attached to a 9.1mm by 9.1mm substrate. 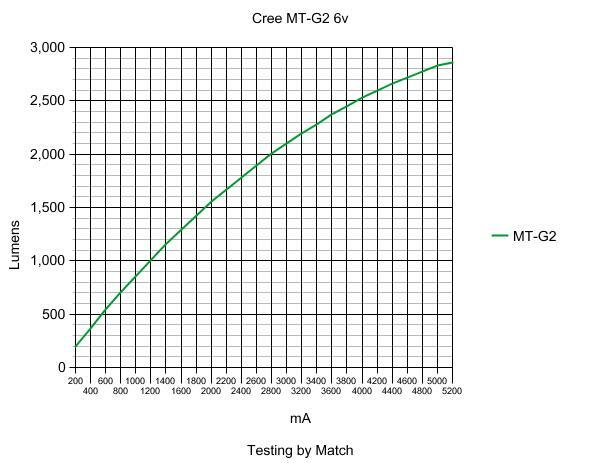 This shows that the MT-G2 can handle current far above the rated 3 amps. At 5 amps it is still increasing and has already reached over 2700 lumens. Feel free to correct me on any mistakes I made, whether they be grammar or technical. Thanks again Scaru. It’ll end up in my files when its finished. I was never really sure what an S2 was since I rarely see them on my shopping research. I thought maybe it was some older XP-G design. Why aren’t they as common as an R5? Excellent thread and info Scaru – thanks for setting this up. … and have a Merry Christmas mate! Wow, I made that thread 2 times in one day. The reason the S2 bin is rarer is because due to it being a very efficient LED it is not produced very often. 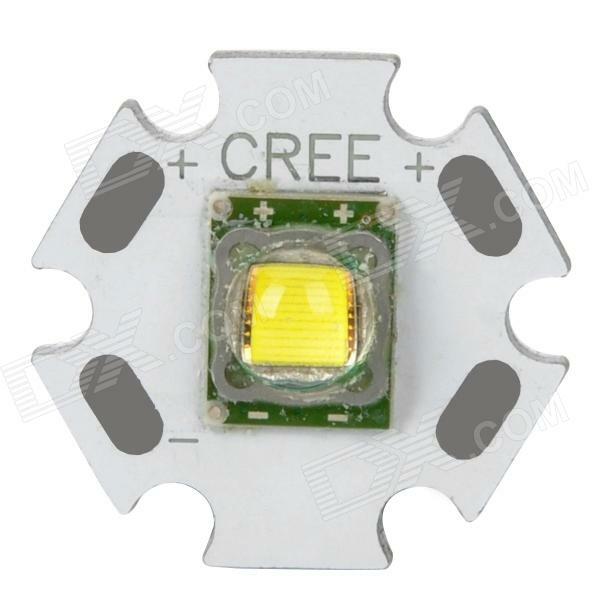 To explain that statement, as I understand it Cree simply produces a bunch of LEDs and then tests them to find out whether they are R5 or S2 along with what tint. Naturally the more efficient ones are rarer. Bump to ask if there are nay other LEDs I should add. It currently has XP-G, XP-G2, XM-L, XM-L2, XP-E, and I'm doing XP-E2 right now. That’s good for me to know. So S2 is kind of like the creme de la creme over an R5? I’m not sure, but I think maybe my Eagletac XP-G minis may be S2. XR-E EZ900?…I’ve got one in my Javelin. IIRC, they did make a batch with S2s. Do you have any requests of other LEDs to add? XR-E EZ900?...I've got one in my Javelin. That's under XR-E. It's basically 1 of 2 kinds of XR-Es. Sorry, I came right to the last post and didn’t noticed you had already added to your thread. I just got my very first Nichia 219 flashlight today. anything that is red or green please. xp-e, xr-e, pt-54, cbt 90, sst-90, luxeon, led engin. scaru, nice work, but you are wrong about the bond wires. Those are, as it says, the small wires running to the die. But I have no idea about the grid..
Dereelight is still installing them in their flashlights. I read that those lines on the die are called current-spreaders. Scaru, a couple quick things. 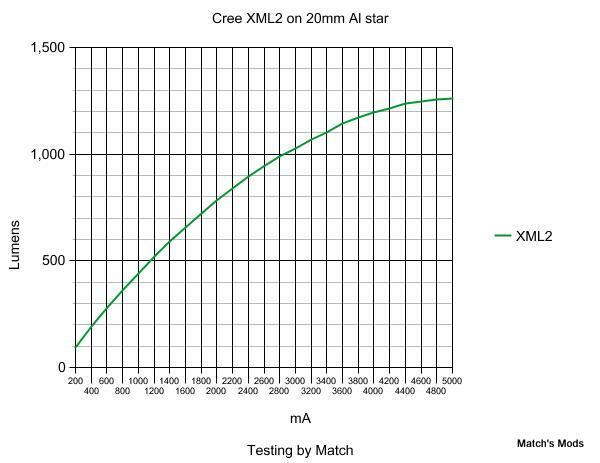 -92CRI 219s are ~4500k, rather than 5000k. 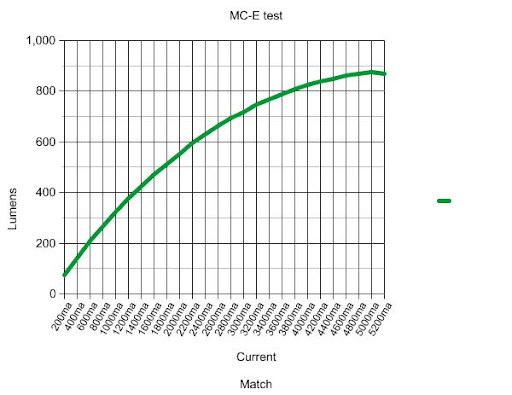 -the XP-E output versus drive current graph is for a green XP-E. I recommend making a note of that in your commentary. 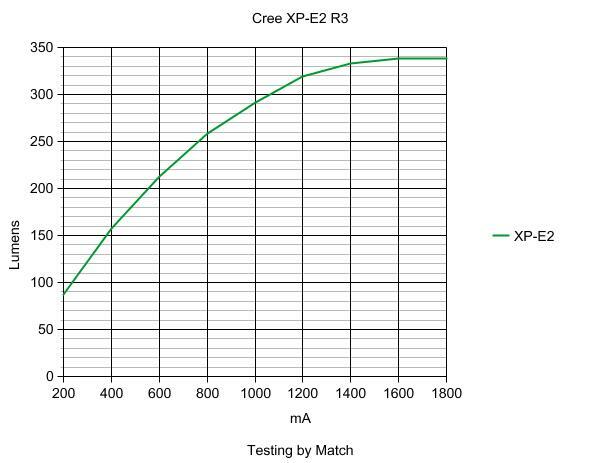 -XR-E typically has a higher forward voltage than newer LEDs (namely XP-G, because Cree recommends both emitters are fed a max current of 1.5A) for the same drive currents. 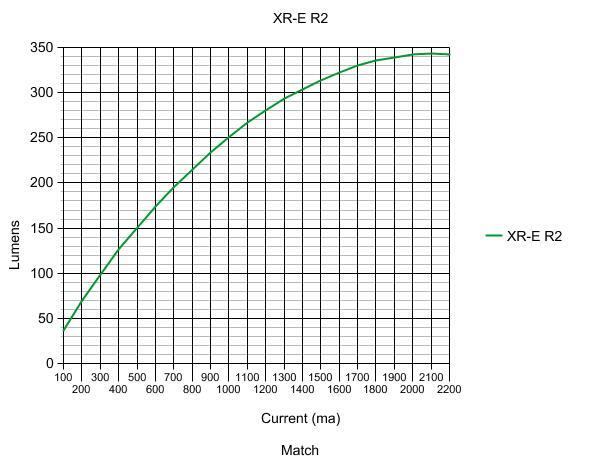 At higher drive levels, the XR-E’s Vf increases dramatically compared to the XP-G because the latter is more efficient (a lower Vf yields lower wattage at the same forward current). Nicely done Scaru. Everyone new to LED flashlights should read this. It is the best compilation yet of all the commonly used LEDs. Thanks for all the compliments guys, I figured this would be a good thing to have so I made it. This along with the tint, brightness bin, CRI thread ought to cover most of the newbie questions about LEDs. I just wish there was something like this when I joined up. This! It should save inquisitive members a lot of searching and reading. Just fixed those things Slim, Thanks! Most of them that Illumination Supply has been shipping lately seem to be in the 4000K-4200K range. Units from earlier batches measured in the 4400K-4500K range. 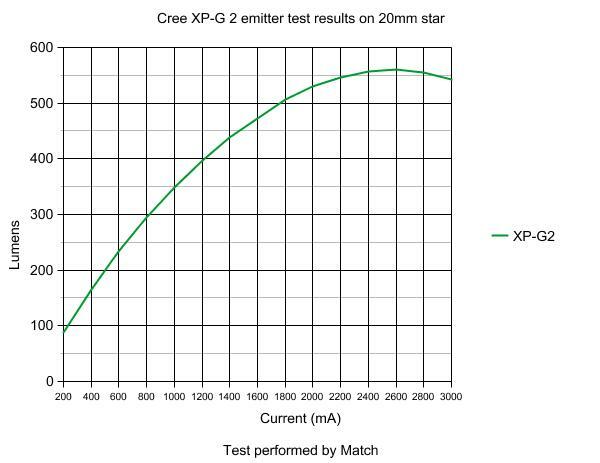 Looks like Nichia users get to play the tint lottery along with the Cree users. Oh wow! This is just the sort of thing I’ve been looking for to get my head around the model numbers. The only other thing I would like to see if possible is the data for SSC P7’s or any other model they do worth looking at. Don’t be a chump, be a chimp! Thanks for the work involved into testing and posting. SSC P7? and the SSC S7? anyone has seen any data about the Z7´s? Scaru - And fantastic thread btw...Sticky!!!! excellent info! we appreciate you taking the time to do this.